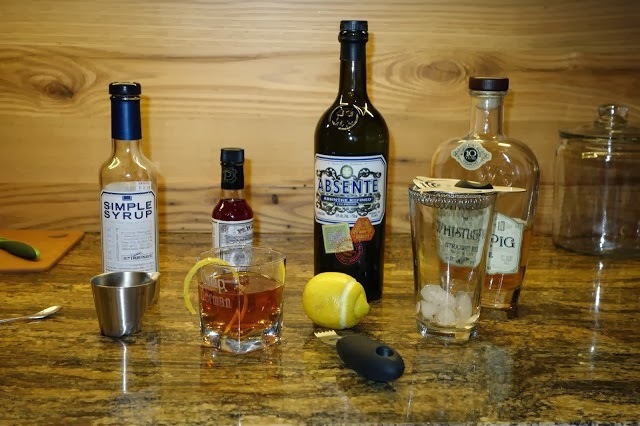 Most claim that this is the oldest American cocktail, having been first created by Peychaud of bitters fame in the 1830s. It got its name in the 1850s when it was served at the Sazerac coffee house in New Orleans. Like many of the early cocktails, this one is all about preparation. After much experimentation, I’ve finally settled on a recipe that is easier to prepare and I think tastes great. 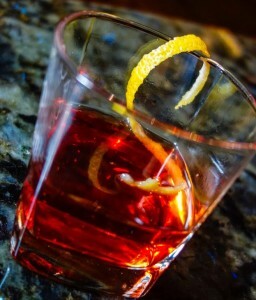 The first thing you need to know is that originally, the base ingredient of the Sazerac was Cognac. 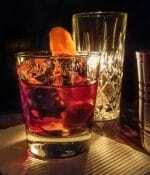 Over time, the drink was ‘mericanized and Rye became the primary ingredient. In fact, by volume, whether you’re using Cognac or Rye, it’s pretty much the only ingredient. Add sugar, bitters and Absinthe in small quantities and you have a Sazerac. 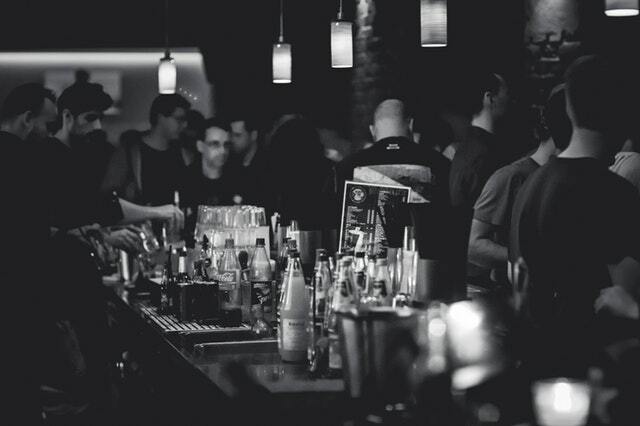 Because it’s dominated by a single liquor, you’ll want to use the best brand you have. In my case, I used Whistlepig Rye and Remy Martin VSOP Cognac. Choose your favorites and test ‘em out. Whether you use Cognac or Rye, part of the classic recipe involves muddling a sugar cube with bitters. Yeah, this is a cool part of the bartending show and all, impressing your guests by man-handling a sugar cube, but life is short. So, here’s the sacrilege and the concession to ease of making . . . I use simple syrup* instead. Oh my GOD! I can hear the collective gasp, but if you promise not to tell, neither will I.
I use a little less Cognac than I do Rye when making the drink. I’d think that the Rye would be a stronger taste and call for just the opposite. I’d love to hear about your experiences. Please comment. Also, I use a dash of Angostura bitters alongside the bigger helping of Peychaud’s. 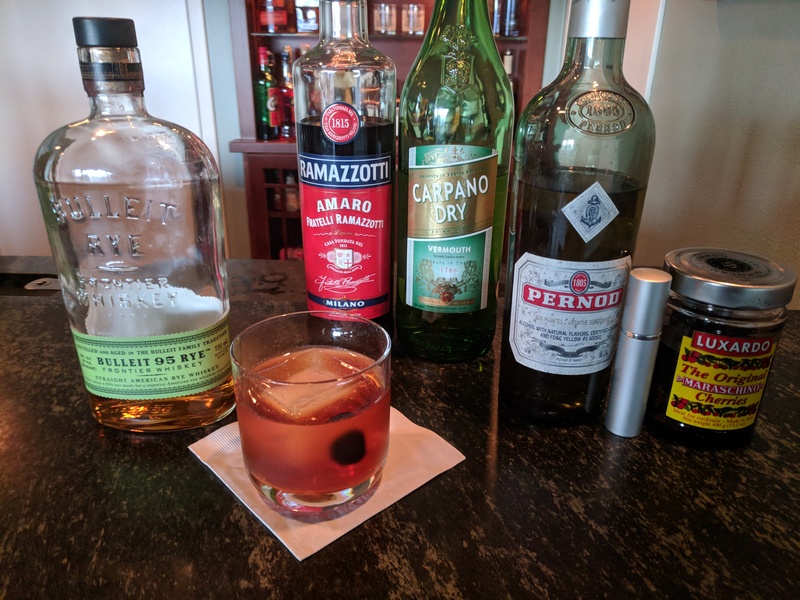 The original recipe calls for Peychaud’s alone, but I ran across several bartenders adding the Angostura and I think it really enhances the drink. You’ll need a large mixing glass for preparation and an old fashioned glass for serving. OK, now the preparation . . .
Place several ice cubes in the old fashioned glass, fill with water and set aside. You will dispose of the ice water later. For now, you’re just cooling the glass. Place several more ice cubes in the mixing glass and add the Cognac/Rye, simple syrup and bitters. Stir gently. What you’ll do now is called a wash. Dump out the ice water from the old fashioned glass and pour in about 1/2 oz of Absinthe (or your substitute). Swirl the Absinthe around the glass, making sure you coat the entire interior of the glass. Once done, toss the rest of the Absinthe down the drain. Trust me, it’ll be enough. For other options on how to do an Absinthe wash, watch this video. 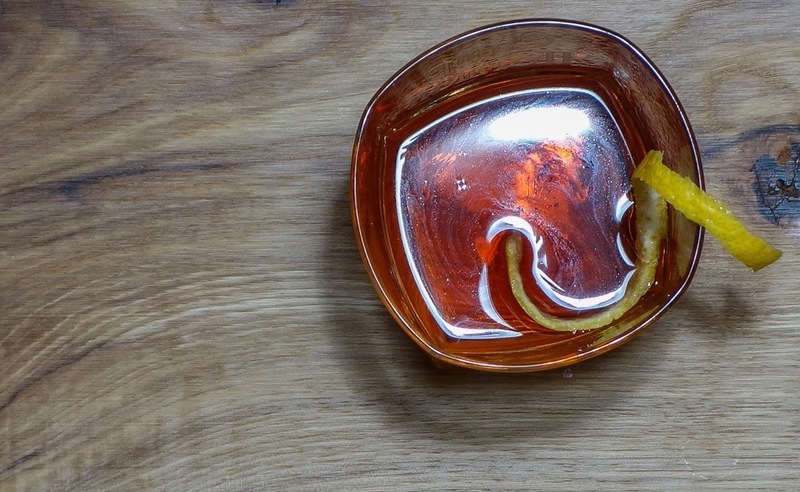 Strain your glass of Cognac/Rye, bitters and simple syrup into the Absinthe-laden glass. Then peel a lemon over the glass making sure all of the zest goes into the glass. I like to throw the lemon peel in, although many like it pulled out at that point. That’s it. 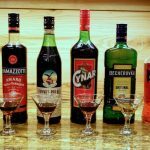 Delicious drink, very strong and much easier to prepare than it sounds. I’ll have another . . . Enjoy. * Simple syrup is easy to make and even easier to buy cheaply at the store (I used the store-bought variety here). It’s just a 50/50 mix of sugar and water heated on the stove until it’s all liquid. 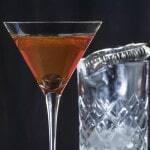 Instead of coating the Old Fashioned glass with Absente, pour in about 1/8th of an ounce of the liqueur in an ice-filled shaker with everything else. Err on the shorter side here if anything, the anise-taste of the Absente is very strong. 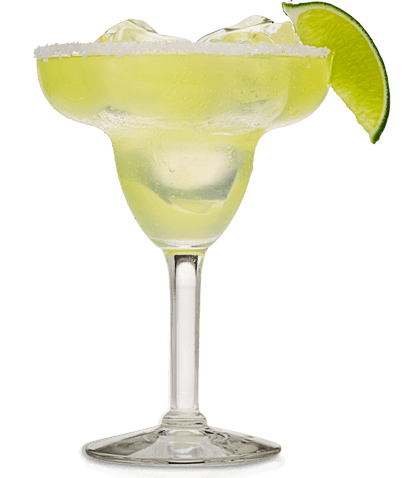 No need for a separate mixing glass either, strain right into the serving glass. I made these two at a time last night. They are strong drinks. The Absente is 110 proof and 6oz of rye per person is a lot to start with. My Absinthe method is to use an atomizer and spray the absinthe onto the ice in the mixing glass. Generally, I’ve found that one spray is enough if you want to “enhance” the drink vs. two or more if you want to actually taste the absinthe separately. 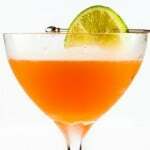 Using an atomizer is a great idea and certainly goes along with the classic quantity of Absinthe used in most recipes. Perhaps it’s because I’m using Absente instead of Absinthe or even Herbsaint, but I like it a little stronger, that’s why I go to an 1/8th oz, which is substantially more than a spritz of an atomizer. To each their own, though. The anisey-taste of Absinthe/Absente/Herbsaint is quite strong so using it sparingly at first might be wise. I’ll have to measure but I bet two atomizer squirts is about 1/8 oz. I have Pernod, and at the rate I’m using it, I will have to leave it to my kids. I made this using Larressingle VSOP Armagnac. Very, very good. I think the key thing to realize is that this drink is a way to enhance drinking the liquor straight, as opposed to a full-on synthesis.